It’s no secret I’m an Arkham Horror Files fan. I’ve jumped into the murky waters of Innsmouth, tackled the Dunwich Horror, and fought off cultists, mobsters, other creatures on the streets of Arkham. 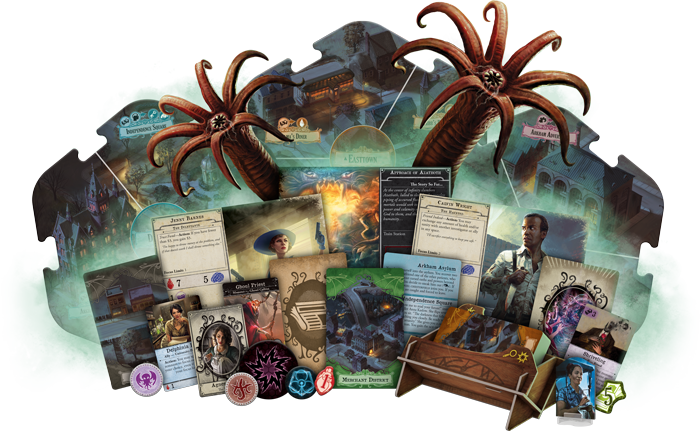 Fantasy Flight Games has created a fantastic setting full of Lovecraftian Horror and pulpy adventure – and I can’t get enough. When Arkham Horror Third Edition went up for sale last week, I jumped at the chance to get a copy and scored the Deluxe Rulebook, too! Now I’m sure you’ve got a friend or two that have a copy of Arkham Horror: The Board Game. This game has been around for awhile but FFG just released the new Third Edition. I have gotten quite a few games of the previous versions under my belt and so I was excited to see the changes in the Third Edition. The first major change is the amount of time it takes to play a game. A typical game should take 2-3 hours, but our first game of play took about 4 hours – but that’s because we were all learning (and there were 5 of us). The game is also designed for 1-6 players right out of the box as well – no need for extra expansions (yet). Another major change was the objective of the game – when we started playing there were a handful of clues on the board and that was pretty much it. We had a scenario card but and a couple of cards in the codex, but no clues on how to actually “win” the game yet. The board is completely different as well. It’s a created based on the scenario and uses different double-sided tiles plus “road” tiles to connect the neighborhoods. Each neighborhood is made up of 3 areas – and that’s where the majority of the action happens. Action Phase – this is where players take turns performing two actions each. 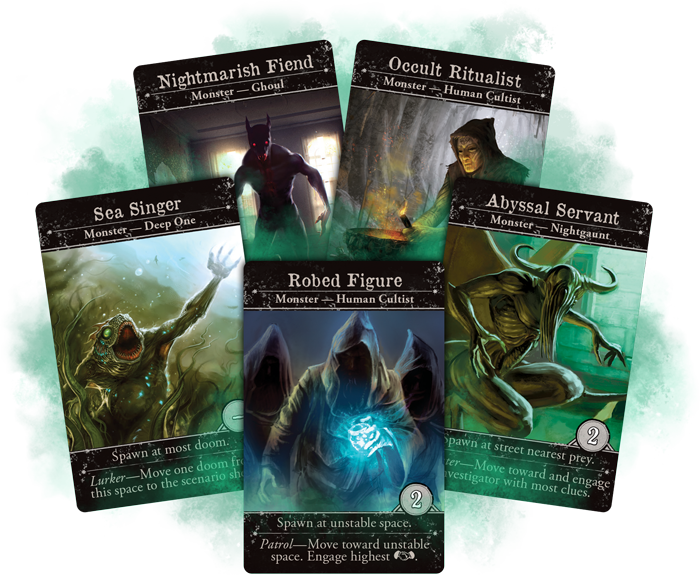 Monster Phase – if there are any monsters on the board, this is when they activate and attack players. 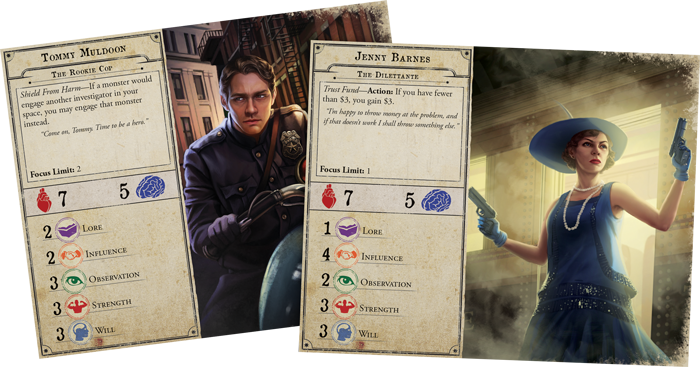 Encounter Phase – this is where players will draw a card based on their location and get to make choices (also typically when players will discover clues). 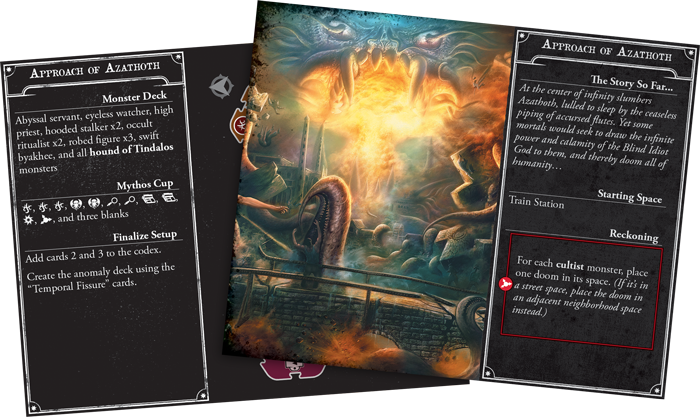 Mythos Phase – Each player takes a turn and draws 2 tokens from the Mythos Cup and resolves those effects. From our play through, we had a party of 5 that worked really well together. We had two “guardian” types (who were great at fighting creatures) and three “mystics” (that were fantastic at warding away doom). The game scenario we played actually reminded me a lot of Pandemic – we had to manage the Doom being gathered in the different areas and also manage the different cultists that were spawning. In fact, this game has a lot of similarities to Pandemic mechanically, but it plays VERY differently. 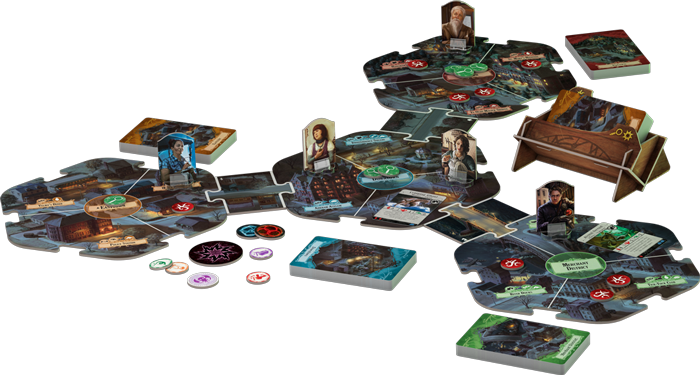 The good news is that if you and your group of friends can handle Pandemic’s mechanics, you’ll easily be able to adapt to Arkham Horror Third edition. The game did play a little slow at first – we had to refer to the rules a lot when it came time to draw from the different decks – “Do we pull from the top or the bottom? We shuffle the discard pile onto the bottom of the deck? Draw the top 3 cards, add this card and then shuffle? What does the burst do again?” It sounds complicated, but it’s really not. After a few rounds it became pretty easy to remember what was what and the speed picked up. Most of the checks in the game are Skill based. You take a look at your stat, you roll the number of dice equal to your stat. If you get any 5s or 6s – the it’s typically a success. For combat, each success equals 1 point damage you do to a creature. If it’s got 4 health, you need 4 successes to kill it. Thankfully, damage sticks so you can take down tough monsters over time – if they don’t kill you first that is! You can also spend an action to Focus a stat. This give you a 1+ to that stat as long as you remain Focused on that stat. You can even spend that focus token to re-roll a die for any skill check, even if it’s not matching. I really liked this mechanic as it let you shore-up a weakness or go all-in on a strength. Some characters can even have two stats focused! Over the course of the game we lucked into a few great item pulls that helped out tremendously and honestly, I thought were we coasting for a bit – until we weren’t! By the end of the game, things had turned and we had gone from almost no monsters to “oh crap” mode. Thankfully, we saved the day before we got overrun – but the game definitely felt like there was a crescendo of action at the end – it was very dramatic. Overall, the game had a bit of a ramp-up but once we were going, it was pretty smooth sailing mechanically. The game has a lot of clever mechanics built in to help the flow. You want to move to areas with lots of Doom to help clear it out, but those areas also have clues typically. You want to engage the enemies and fight them because you’ll get boons you might be able to trade in later. The board even has a cool visual language to it that you’ll pick-up on and be able to figure out which areas you want to explore or have an encounter at next. Playing it felt really, really rewarding – and that’s the type of game that will keep me coming back for more. Arkham Horror Third Edition is a great game to have in your collection. The components are well made, the mechanics are solid but not too dense to learn, and the game play just feels fun when you’re in the thick of it. 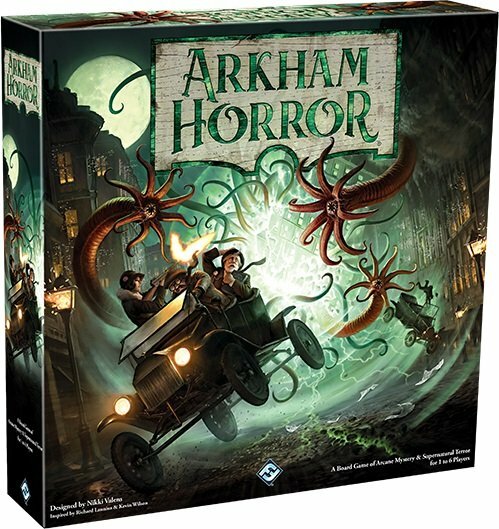 If you played the previous Arkham Horror Editions and wished they were a little more variable, then you’re going to love this version of the game. You’re not just running around closing gates – you’re playing out a story that unfolds as you move through the city. It’s a really cool way to experience an “adventure” from the tabletop. I can’t wait to go back!